On arrival at the field yesterday, the breeze seemed very light and variable. Looking across at an adjacent field, which I have used very occasionally, it was decided to fly there again. Just for a change. But what was this... Several people were fiddling about, pulling arrows out of a large target. Now, that was a 'red flag'. I didn't want to get shot at while flying! And close by, there it was - a literal red flag. Just above the sign saying, and I paraphrase, 'tick off if the red flag is up!' So I did. Shortly after, at the more usual flying field, the bright orange 2-Skewer Diamond was soon flitting about on several meters of line. A prolonged gust saw the small kite quickly climb and take out 30 meters (100 feet) of 20 pound Dacron. This diamond kite was the very one in the image that brands My Best Kite on each online platform - website, Facebook page and Pinterest page. You know, the orange diamond with black tail against a blue sky with a hint of cloud. You might even see it in your browser tab up there. Back to the aerial action... With the wind so very light and dropping out completely from time to time, it was tricky keeping the kite up. Eventually, 60 meters (200 feet) of Dacron was out. But not before plenty of ups and downs and pulling the kite right in to within several meters of my hand. Sizable Spring thermals were about, shifting the breeze direction all the time. In fact, at one point, the kite was hanging up at 50 feet while I felt the breeze on my face! Of course, when the kite got lower, it was hard to pull line in quick enough before it touched the grass. A tail-wind landing! Some time later, with a decent puff of breeze from behind, the 2-Skewer Diamond soared to 200 feet way overhead. At the zenith, the line went slack and took on long sweeping curves, showing how the wind direction was different at different heights above the ground. 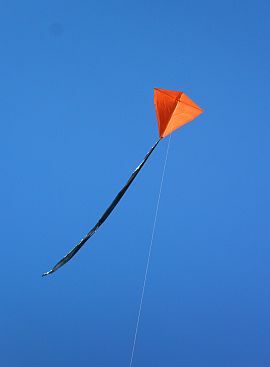 At other times the light-weight kite just hovered or even climbed slowly with the line hanging vertical. Almost zero tension back at the winder! So, it was a spot of quite pleasant Spring flying, in sunny weather. With the sun going down and an ever-so-gentle breeze barely moving the leaves on the peach tree, I decided to put up the 2-Skewer Diamond from our small backyard. This was yesterday afternoon. The trimming hole has been sealed up with sticky tape, and its function replaced with a small length of sail plastic taped near one tip of the horizontal spar. In flight, it's really not that obvious. Well, what a flight it turned out to be. After a few attempts to get the kite to stay above gutter level, it finally caught a waft of breeze and soared up to a high angle. A few more meters of line went out, and then a few more. Flying right on the 'edge of the envelope'. Sometimes barely able to climb, then not quite able to maintain height. Keeping yours truly busy on the line! Eventually, the bright orange Diamond was at something like 3 or 4 times the height of our roof, and well over the neighbor's property. Bringing the kite in was straightforward. It's nice being only 2 strides from the back door away from a kite flying location! Yesterday's 'window of opportunity' that is, to get out and fly something while the sun peeked out and wind speeds were down somewhat on previous days. There were still some fresh gusts moving the tree tops around and loudly rustling the leaves when we arrived at the reserve. I was hoping the wind would moderate after some rain clouds moved on, out to the West. In the meantime, we put up the 2-Skewer Diamond, and it coped quite well. Soon, it was powering around the sky, occasionally being pushed down and to the right by the wind strength. After a few minutes around 350 feet, I brought the bright-orange Diamond down, with optimistic thoughts of trying the 2-Skewer Sled. The breeze certainly was too strong for the Sled initially, causing it to collapse frequently. This kite does re-inflate rather well though, perhaps because of the angled (non-parallel) vertical spars. Hence there was one flight where it went through an accelerate / collapse / re-inflate cycle more than half a dozen times! Later, there was a lull in the breeze, and the 2-Skewer Sled managed to stay inflated long enough in the still-turbulent air to get a movie for the web page. Hopefully, more ideal conditions might come along later in the week so I can do justice to this very light and efficient little Sled kite. All this time, the trusty Windtronic meter was running. The breeze had averaged 5.1 kph and peaked at 18.9 kph. May and I walked down to the nearby small reserve with the boys. The weather: very pleasant air temperature and sunny, with a moderate amount of high cloud about. We had with us the Tiny Tots Diamond and the 2-Skewer Diamond. The former on polyester thread and the latter on 20 pound Dacron. Both kites flew magnificently in the gusty gentle breeze. 'Gentle' in the technical sense, meaning a wind strength no higher than 19kph (10 knts). 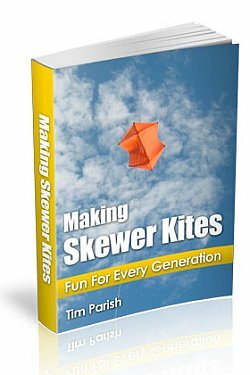 It's on Wikipedia, it must be true ;-) Most of the kids had a go on both kites, not to mention having a great time trying to pelt the orange 2-Skewer Diamond with twigs and seed pods when it was low! It was a real pleasure seeing once again how the tiny Diamond on thread was able to handle quite a wide range of wind speed. On its single-point attachment to the flying line. The very simplest kite I have ever designed and built - although the Simple Diamond made from dowel and thicker plastic is essentially the same design, except scaled up. The 2-Skewer Diamond could have done with a touch more tail length to stay straighter in the freshest gusts today. But it still soared high on around 100 feet of line. When lower down, turbulence from trees upwind made things a bit more interesting for both kites. All up, some easy, enjoyable and thoroughly uncomplicated flying today!